Looking for a durable, textured flooring surface for your golf course? Look no further than PEM Golf Course Matting! Our slip-resistant flooring will perfectly service every high traffic area on your course, thus providing players safety and comfort. Recently, the fine folks at The Golf Club of Tennessee contacted us about installing our slip-resistant matting on their bridges and steps. Because these areas tend to see high levels of foot traffic, we suggested that they go with our high friction golf course matting. Not only can this particular application hold up over time, it can greatly reduce the risk of slips and falls. The club ended up installing 2,500 sq. ft. of 2ft wide PEM High Traffic/High Friction flooring on all of their bridges and steps throughout the entire course. 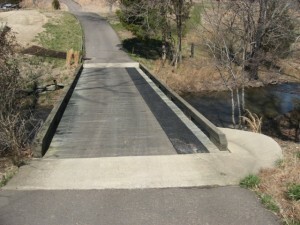 The additional slip-resistant properties of the high friction grit coating have enhanced the overall surface of the bridge, providing peace of mind for both course employees and customers. Aside from its slip-resistant properties, our golf matting is also easy to install! Simply apply a 1/4″ bead of adhesive in a herringbone “V” shaped pattern every 4-6 inches. This will ensure that your flooring will remain secure during the lifespan of your application. In an effort to make the adhesive application as simple as possible, we have created an adhesive bead pattern diagram that will help you through the process. As always, if you need any help, please feel to drop us a line at 800.783.2358. We are here to serve you! 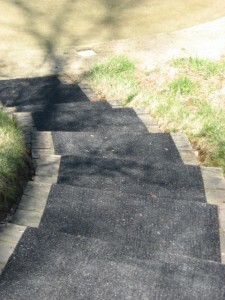 PEM Golf Course Matting has been installed on over 2,000 golf courses worldwide. If you would like to learn more about our Golf Course Matting and/or our High Friction Golf Course Matting, please feel free to reach out today!